New interviews with Andrew WK, Confide, Crime In Stereo, Eyes Set To Kill, and Girl In A Coma. THE WONDER YEARS – PRE-ORDER NEW ALBUM! The Upsides, the long-awaited, highly anticipated sophomore full-length from Philly’s very own pop punk juggernauts, The Wonder Years, is now available for pre-order. Cruise on over to No Sleep Records to secure your very own copy of this amazing record, which will see an official January 26, 2010 release date. As a special pre-order bonus, No Sleep is offering an limited-edition 7-inch featuring a brand new, non-album track titled “Leavenhouse. 11:30.” The label has pressed 500 copies of the clear vinyl release, which boasts a screened B-side and can only be obtained with a purchase of the new CD. Furthermore, there are several “Pre-Order Only” package combinations available which include the aforementioned 7-inch, plus an exclusive tee shirt and hoody. For more info and options, go here. Additionally, all pre-orders will receive a free autographed poster while supplies last. It’s also worth noting that each CD copy of The Upsides contains a code to download three remixed / remastered mp3s from The Wonder Years’ debut album, Get Stoked On It, that will be included on an upcoming collection release titled Six Dudes From The Keystone State. In related news, The Wonder Years will be playing a few shows after Christmas with Valencia and Crime In Stereo. This of course is just a prelude to the massive amounts of national touring in 2010 in support of the release of The Upsides. 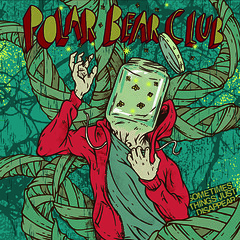 Polar Bear Club is about to embark on tour. Check out the band at the following places! Polar Bear Club will follow up their September dates with an October U.S. tour to include West Coast and Texas markets, culminating at the The Fest in Gainesville, Florida over Halloween weekend. The band will be touring with good friends Broadway Calls, Crime In Stereo and The Swellers (line-ups will vary). More details and dates soon. SEP 26 – New Orleans, LA @ House Of Blues w/ The Gaslight Anthem, O Pioneers!!! SEP 27 – San Antonio, TX @ Rock Bottom w/ The Gaslight Anthem, O Pioneers!!! SEP 28 – Dallas, TX @ Prophet Bar w/ The Gaslight Anthem, O Pioneers!!! SEP 29 – Little Rock, AR @ Vino’s w/ The Gaslight Anthem, O Pioneers!! !